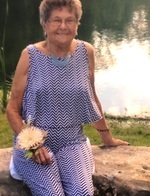 Jessie Elaine Lowe, 85, passed away early Sunday morning, April 14, 2019. She was born December 12, 1933 in Erlanger, KY, daughter of Jesse and Elizabeth Burkhart. 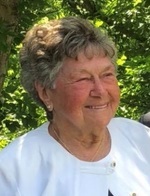 She is preceded in death by her parents; her daughter, Dale Ann; her grandson, Christopher Webster; her son-in-law, Tim Beckner and many other loved ones. Jessie was an honest, outgoing, loving woman who had a knack for telling you like it is. She was proud of the eight children she raised and the many years she served as a Certified Nurse’s Assistant. She was strong and tenacious, often making those around her laugh with her wit. Jessie couldn’t miss a yard sale or a trip to the casino, saving up her yard sale finds and casino rewards to gift to her friends and family. She loved being surrounded by family. She is survived by her devoted husband, James Lowe. The newlyweds recently relocated to Florida, and while “Pops” (or “Papaw Jimmy”) will miss his bride profoundly, he will continue to be a big part of “his sugar’s” family. Jessie is also survived by eight children, Lee Arkenau (Wayne) of Falmouth, KY, Trudy Kimmel (Randy) of Falmouth, KY, Russell Webster of Bronson, FL, Mark Webster of Gainesville, FL, Rose Beckner of Butler, KY, JR Webster (Jennifer) of Berry, KY, Don Meinze (Ann) of Alexandria, KY, and Jimmy Lowe (Karla) of Anderson, SC; her sister, Audrey Knauff (Lee) of Fruitland Park, Florida, four brothers: Sherry Dale Burkhart (Pat) of Independence, KY, Colin Burkhart (Debbie) of Ft. Worth, Texas, Ed Burkhart (Marie) of Fruitland Park, FL, Tony Burkhart (Sharon) of Augusta, KY, 16 grandchildren, 14 great grandchildren, and 1 great great grandchild. In lieu of flowers, the family suggests memorial donations to Firehouse Ministries, PO Box 71, Butler, KY 41006. To send flowers to the family of Jessie Elaine Lowe, please visit our Heartfelt Sympathies Store.